With a great zoom range, constant f/2.8 maximum aperture and excellent performance, the 12-40mm f/2.8 is practically perfect as a pro-spec standard zoom for an Olympus OM-D camera. Most digital photographers don't really like swapping lenses on their cameras unless they really need to. That's especially true when using a compact system camera in dusty conditions, where your image sensor is laid bare to the elements. While a standard zoom is the 'go to' lens for most of us, and the one we use most in daily shooting, this one goes further than most in terms of versatility. The generous zoom range is equivalent to 24-80mm on a full-frame camera, taking in everything from generously wide-angle shooting to short telephoto. It does all this with a fast and constant f/2.8 aperture. This not only helps to keep shutter speeds fairly fast even under dull lighting conditions, but also enables a reasonably tight depth of field in the longer section of the zoom range – an area that's a particular challenge to the Four Thirds system with its relatively small image sensor. Somewhat smaller and lighter than the 7-14mm wide-angle zoom (also reviewed), this one weighs in at 382g and measures 70x84mm. Even so, it feels a more natural fit on OM-D rather than PEN series bodies. There are two ED elements and two HR elements in the optical path, which is based on 14 elements in total, arranged in nine groups. Physically, the lens is at its shortest at a focal length of 16mm. It extends slightly as you zoom towards 12mm, and rather more so towards the 40mm end of the zoom range. Focus is fully internal so there's no extension or rotation of the front element. Like most lenses in this test group, this one features a 'manual focus clutch', so you can switch from autofocus to manual focus simply by pulling the focus ring rearwards. Manual focus itself is based on a fly-by-wire system, which controls the lens's focusing stepping motor. There's also an 'L-Fn' (Lens Function) button, which you can assign to any of a wide range of functions via the custom settings menu in the host camera. 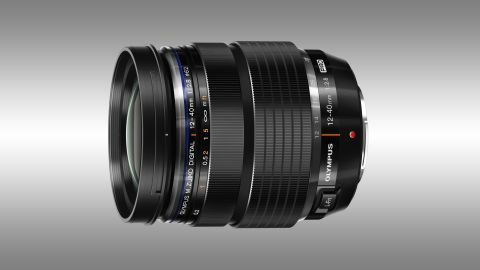 Typical of Olympus 'Pro' line lenses, the metal outer barrel is beautifully engineered and the overall construction is dust, splash and freeze-proof. ZERO (Zuiko Extra‑low Reflection Optical) coatings are applied for controlling ghosting and flare. Sharpness across the whole frame is very impressive, right into the extreme corners. Better still, there's practically no drop off in sharpness even at the widest aperture of f/2.8, throughout the entire zoom range. Colour fringing is negligible and distortions are practically non-existent. Overall, it's a great performer with handling to match.